This is a model of a steam engine invented by Hero of Alexandria in about 60 AD. It represents an early example of a machine that will transform thermal energy into kinetic energy. Hero's engine illustrates transformations of energy and aspects of Newton's laws of motion. The engine operates similarly to a rocket engine. 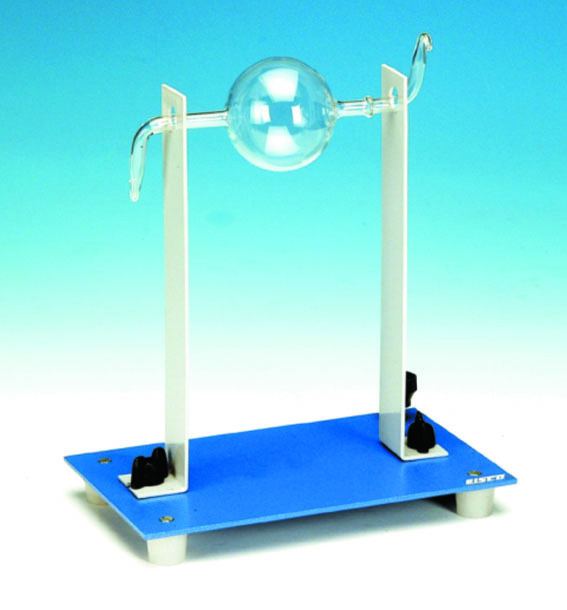 The thermal energy supplied by the bunsen burner (not supplied) is transformed into kinetic energy in the steam jets. These jets possess momentum, and by Newton's third law ('action and reaction are equal and opposite'), give backward momentum and hence backward force to the nozzles from which they emerge. These forces create a turning movement about the longitudinal axis of the glassware and hence the glass apparatus rotates.